Everyone has dreamed of finding that unspoiled secluded beach at some point or other. Visitors and locals all flock to the most accessible stretches of coast in the hot summer, and so seclusion in Europe’s most densely populated country has its price. But there is one such place if you are up for the challenge of finding it…and then trekking down to it and - alas…trekking back up after. Everyone has dreamed of finding that unspoiled secluded beach at some point or other. Visitors and locals all flock to the most accessible stretches of coast in the hot summer, and so seclusion in Europe’s most densely populated country has its price. But there is one such place if you are up for the challenge of finding it…and then trekking down to it and - alas…trekking back up after. 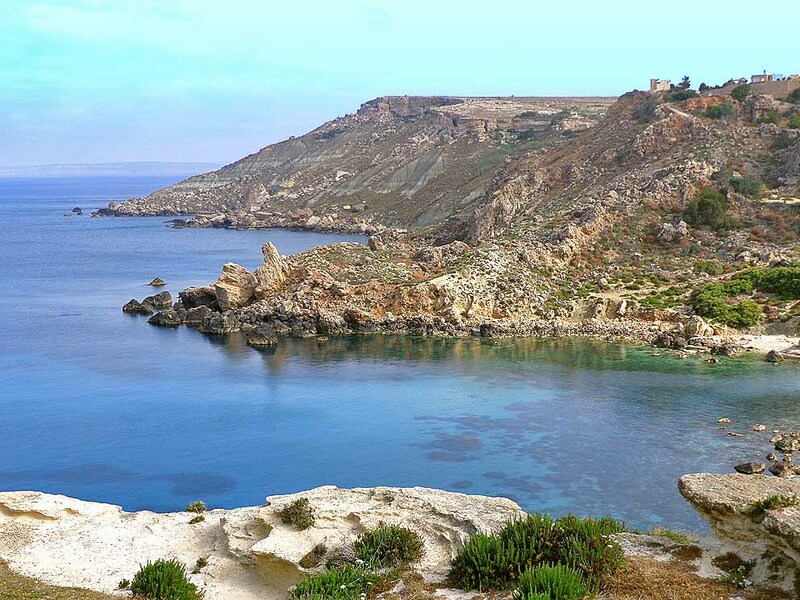 Fomm ir-Rih Bay lies in the west of Malta and getting there is quite a challenge in itself. Driving from Rabat follow the signs to Bahrija and once there drive along its main street and take the first right out of the village (not signposted). 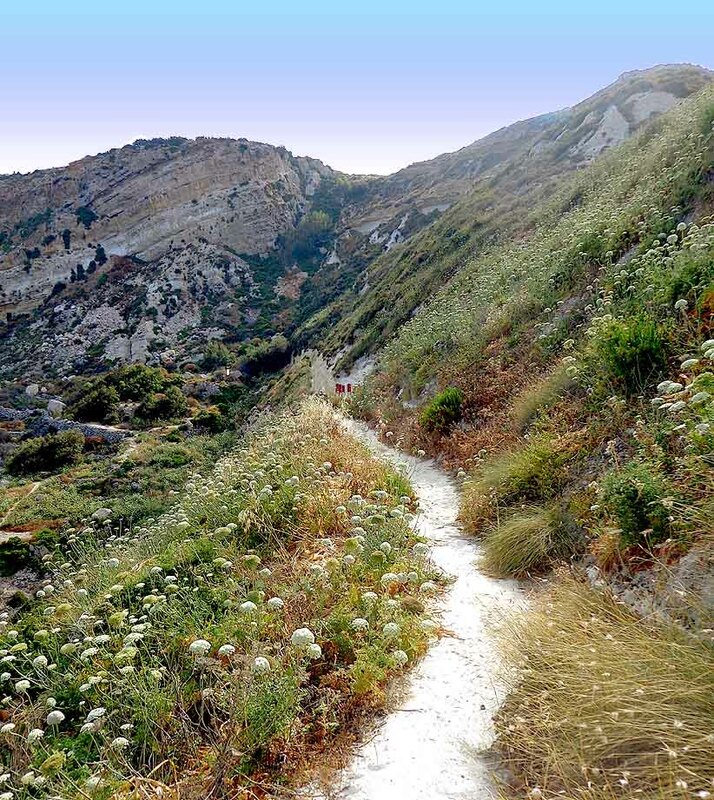 It’s a lovely stretch of road about 2km long following a dry valley with views as far as the cliffs of Gozo. At a fork in the road take the right turn which ends in a small car park. The bay is visible from here – a small stretch of shingle beach backed by clay slopes and cliffs – and the sea itself is heavenly. Pity it is still a hundred metres or so below you…. At the car park’s end there is a small public footpath which leads to the bay below via a cliff hugging ledge that was hewn out for the purpose. Once below the cliff there is still a bit of walking over some rough terrain but ten to twelve minutes should cover the distance from your car to the sea. Fomm ir-Rih (literally the mouth of the wind) has of course no amenities of any sorts and the little shade on offer comes only from a few boulders strewn here and there. You don’t come here for people watching or for the best ice creams… You come here for the silence, for nature’s arid allure, for the clean sea which offers great snorkelling and diving and for the sense of grandeur the small inlet offers, hemmed as it is with a high cliff behind it and another stretch of cliff as the bay’s southern arm, on top of which is the rocky outcrop of Qlejgha hilltop – an ancient Bronze age village site. 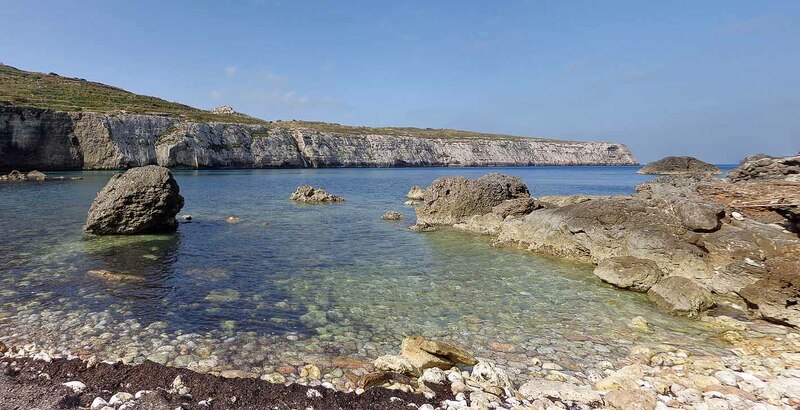 It is not everyone’s cup of tea and if a day out in the heat is too taxing an afternoon visit may be the better option –but be sure to leave the bay some time before darkness falls as again there are no lights to show up the path back to the road. A tempting end to the day is a stop in the village of Bahrija itself. The town square has a few low-key but good value restaurants and is renowned as one of the best places for fried rabbit – a Maltese traditional dish worth trying out. Fomm ir-Rih is best enjoyed on windless calm days and swimming is not recommended when strong westerly winds blow - so do check the weather if you intend to visit. Uneven terrain also calls for sensible footwear.